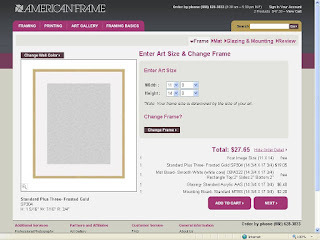 Select your frame by either using the SEARCH function in the upper right hand corner on the home page, or search by category choices listed in the left column www.americanframe.com. For this example, I used the Standard Plus 3 Frosted Gold. Select the “Frame My Own Artwork” option and press “START”. 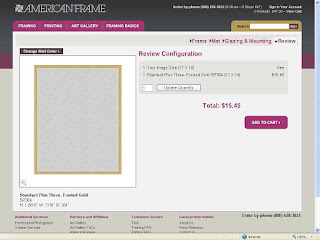 This will take you into the custom framing work flow. 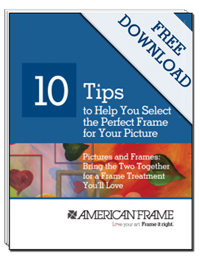 From there, you can elect to preview your art within your frame or not. Input the size of your image, and the price shown will include the frame, free white mat board, standard acrylic and standard mounting board. To deselect any item, go to each individual tab and choose the “no mat” or “none” option to remove it from your frame package. If you are ordering a quantity of over 25 frames, you will find that the new site automatically calculates the discounts so you no longer have to contact us for volume pricing. Still have questions? Please call us at 800-537-0944 M-F, 8:30-5:30 EST. Our operators are here to assist. Hi Laura! I like your new blog feature. Can you explain a little more about how to preview my art in a framing choice? When I tried to do this I got an error message about the file being too large.